When it comes to heart health, it’s important that we think not only of our own cardiovascular health but also that of future generations. A study last year found that obese children and teens have as much plaque in their arteries as a 45-year-old adult, setting them up for heart disease and other serious health conditions much earlier than their parents. If you’ve got kids, of course you want to make sure they grow up fit and healthy. But you also know it’s hard to juggle work, family, and physical activity. Still, setting a healthy example is a good start; research shows that parents who are staying active increase the likelihood that their kids will be active as well. So if you’re looking for ways to get your kids involved, check out these tips. 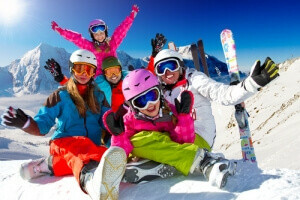 Set aside one day a weekend to do something active as a family: swimming in the summer, sledding or hiking in the winter, or biking in the spring and fall. Taking along a picnic lunch—and splurging on some healthy snacks after a good workout—will help the day go by without a complaint. Ask around at fitness clubs and community centers in your area about yoga or aerobics classes offered to parents and kids together. If your little one is too young to participate, look for classes that help you burn calories with your baby by incorporating them into your yoga moves or pushing them along during stroller workouts. No kids? Check out partner yoga or even doga—yup, yoga for you and your dog. Source: www.health.com; Amanda MacMillan; 2015. Our office specializes in care for the whole family. From pediatrics to geriatrics we can treat everyone in the family for a wide range of reasons. We are proud to announce the addition of new dermatology and aesthetic services, including Botox and Juvederm! Is it time for your mammogram? Are you due for a pap? Let us help you take control of your health. We offer a variety of services including IUD’s, colposcopy, and more. It is as important as ever to be sure you receive your yearly wellness exams. One in four people suffers from allergies or asthma. If you’ve had recurrent sinus or respiratory issues it might be allergies. We offer a full-service screening to pinpoint exactly what it is that triggers your allergies. The testing can be done right here in our office.